Description Smooth data with optionally increasing weights. 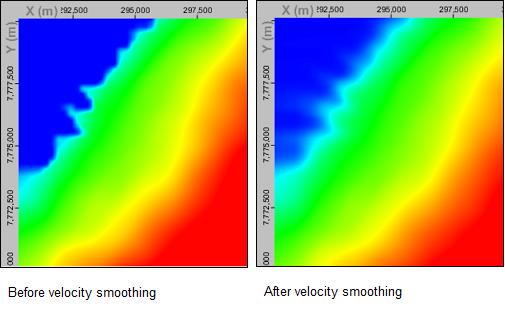 Volume smoothing applies a spatial and temporal smoothing operation to input volumes. The spatial dimensions of the smoothing operator can be configured independently, with an optionally increasing size with depth. The process uses a damped least-squares algorithm to suppress derivatives in each spatial dimension of the input volume. Scroll down and double-click on Volume Smoothing. In the Details Panel, select a Volume to be smoothed. 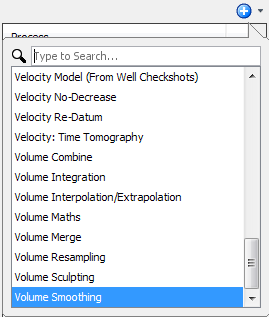 Select the Input is a velocity model check box if the selected input volume is a velocity volume. For a velocity volume, the process will smooth the volume in slowness (1/v) space. This check box is automatically selected if you have selected an input volume with a velocity class assigned to it. It will not be legitimate if the volume contains zero values. Type the smoothing lengths at Smoothing radius in IL direction (changing CL) (m), Smoothing radius in CL direction (changing IL) (m) and Vertical smoothing radius (ms). Based on the smoothing lengths, the system will determine both the spatial windows used to calculate the smoothed output at a point, and the degree of damping used. Type the relative amount of smoothing to be applied at the top and bottom of each trace at Relative weight at maximum depth/time. This parameter is also termed as "mu". The smoothing lengths provided are used at the top of the trace, and are linearly scaled to reach this scale factor at the bottom of the trace. Higher value of this parameter results in a smoother volume at deeper depth. For example: Given a trace length of 8,000ms, smoothing length of 1km x 1km x 100ms, and relative weight of 2: the smoothing window is 1km x 1km x 100ms at 0ms; 1.5km x 1.5km x 150ms at 4,000ms; and 2km x 2km x 200ms at 8,000ms. Internally, holes are temporarily filled in before smoothing. If the Fill holes option is selected, the holes will be left filled in the output. 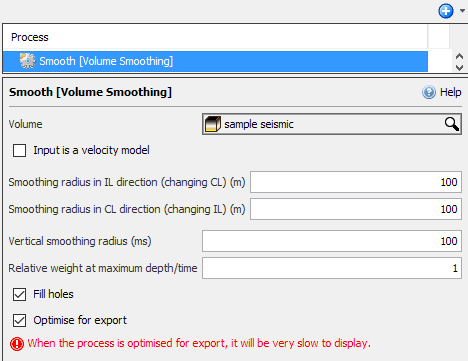 Only select the Optimise for export check box to optimise the output volume for rapid export. Do NOT select this option for normal display and QC.